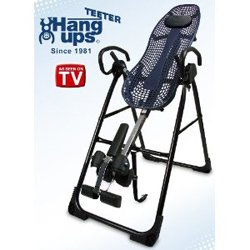 Teeter Hang Ups Inversion Table is a revolutionary piece of equipment which claims it can help relieve back pain, improve joint pain, build and tone muscles and increase your flexibility. The science of Teeter hangs ups is based on the fact when you inverse your body it will relax your muscles, decompression relief, reduce nerve pressure and realign your spine. There has also been a clincial trial in which 70.5% of participants avoided surgery through using both Teeter Hangs Up and physiotherapy. Though it may look daunting hanging upside down, Teeter hang ups are designed to be both stable and safe to ensure it does not tip over through its heat-treated steel for structural integrity to auto-locking hinges that securely anchor the bed to the base. Using the inversion table is very simple. According to their website all you need is a few minutes of day for you to start relieving pain in your back. With your help we can reach more people and let them know about Teeter Hang Ups whether this product works or not. This thing is so heavy and hard to put together that I would not recommend to anyone. The day after putting it together, I was as sore as if I had run 5 miles. The customer service is not good, and if you ownat to send it bakc you have to pack it exactly like it came, (in a damaged box by the way), or they won't refund all your money. The re-packing instructions are aas complicated as the instructions to put the thing together. The DVD that comes with it has assembly instructions that are essentially useless. I was on the verge of tears, and my daighter just broke down and cried after she realized how much trouble this thing is and that to return it will cost $100.00 or more. I cannot use it becasue the ankle tension thing doesn't work right and the "Customer Service" from Teeter Hangups would be a joke if the product were not so expensive. I feel bad that my daughter spent her hard earned money on this piece of very expensive junk. If you want an inversion table you should jsut go to Big 5 or somewhere that has an easier return policy. If you have ANY true back problem stay away! I have degenerative disk disease. I ASKED customer support if it would help or hurt me and if it was ok for people with spine problems and herniated disks. They said yes it's ok many people with medical issues find it helpful use it. I tried it ONCE and was laid up in bed for a week unable to walk. If your spine is healthy you may not care to buy stuff like this. But their customer service to make a sale knew I said I was disabled and still sold it to me. They obviously don't care if you're hurt. Maybe one day if a person gets permanently hurt and not just a week they may care.